This privately operated holiday tourist park is ideally situated on the rivers edge in a vibrant coastal regional centre, three kilometres from the centre of town and minutes from regional shopping. The region is known for its temperate year round climate. Picturesque and immaculately appointed the park lies facing the river on a one acre plot in a tropical setting, with proximity to great fishing, beaches and excellent surfing. Developed in the early 1960's the current owners have been in possession since 1997 and it's time to retire. The sought after location of the park lends itself to be sub divided or developed for alternative use, and may be considered by a buyer as a unique business opportunity with steady income, and the opportunity for future development on the main river. Currently consisting of 12 cabins and 9 fully serviced sites, there is also the opportunity to increase specification of the cabins to boutique holiday accommodation and convert existing caravan sites to boutique cabins. Immaculately maintained the park consists of 12 well styled cabins and 9 fully serviced caravan sites. The main building consists of an office area, two 1 bedroom flats with a 2 bedroom residence upstairs. One of the downstairs flats is for the manager if required and the other two flats are currently rented. The residence has a covered wide veranda overlooking the river where you can watch dolphin or spot a koala in the trees. Modern professional website with booking capability as well as advertising on booking.com. This tourism enterprise is the only one in the area with the proximity to the river and the property has a large frontage with river aspect. This Caravan Park Business is one of 24 businesses for sale in NSW North Coast, New South Wales, and one of 1 Caravan Park Businesses in this region that a business for sale currently has on offer. 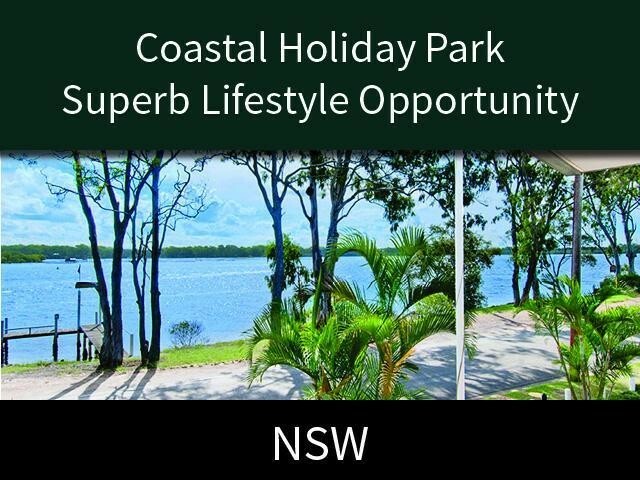 This Caravan Park Business is for sale in NSW North Coast for the asking price of $3,200,000 + SAV and is new to the market.